Ovarian cancer occurs when certain cells within ovaries, the egg-producing female reproductive organs, grow in an uncontrolled, abnormal, manner. The cause of ovarian cancer, the fifth most common cancer among women, is unknown. 18F-FDG PET/CT images of recurrent ovarian cancer 10 months after treatment with radical surgery and adjuvant chemotherapy: maximum-intensity projection (A) and transaxial images delineating uptake of radiotracer in liver (B), peritoneum (C), and locoregional lymph nodes (D). The American Cancer Society estimates that in 2011, 22,000 women in the United States will be diagnosed with ovarian cancer and more than 15,000 women will die from the disease. Ovarian cancer is highly curable when treated at an early stage. However, because there is no effective screening test for the disease and symptoms are often vague, the majority of women are diagnosed at a late stage when survival rates are very low. Early detection and accurate diagnosis are the key to increasing ovarian cancer survival rates. Researchers believe molecular imaging holds promise for evaluating ovarian cancer. Studies also show that hybrid imaging, such as a combined PET-CT scan, is highly accurate for detecting recurrent ovarian cancer and for determining the best possible treatment plan. 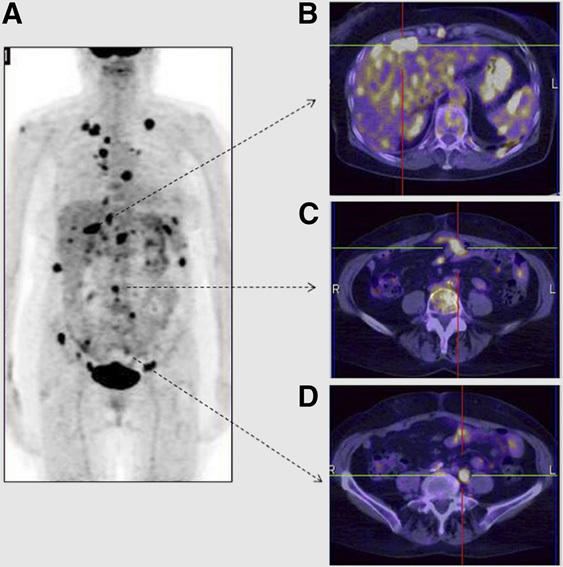 The molecular imaging technologies currently being used for ovarian cancer are positron emission tomography (PET) scanning and PET in conjunction with computer-aided tomography (PET-CT). How is PET used for ovarian cancer? PET involves the use of an imaging device (PET scanner) and a tiny amount of radiotracer that is injected into the patient’s bloodstream. A frequently used PET radiotracer is fluorodeoxyglucose (FDG), which the body treats like the simple sugar glucose. It usually takes between 30 and 60 minutes for the FDG distribution throughout the body to become fixed. PET-CT is a combination of PET and computed tomography (CT) that provides detail on both the anatomy and function of organs and tissues. This is accomplished by superimposing the precise location of abnormal metabolic activity (from PET) against the detailed anatomic image (from CT). ﻿How is PET used for ovarian cancer? Stage: by determining the location of the cancer and where the cancer has spread in the body. may eliminate unnecessary surgeries after treatment by differentiating between tumors and benign residual masses.